If you didn’t have the chance to pop in the Book Arts Center while Jen Farwell from Starshaped Press was here don’t worry we have a recap for you! As soon as Jen arrived she hit the ground running! She only left the letterpress studio to eat and sleep! It is always a treat to see the responses of printers and binders when they visit the center without fail they are overwhelmed with joy and can’t believe the facility. This was the case for Jen. On day one she was already rummaging through our ornament collection and a lockup was beginning to take form on our composing stone. When I saw all the containers of ornaments everywhere she assured me she had a system and knew where everything lived. Each day her poster lock up began to transform. It was an exceptional experience to see how she brainstorms; problem solves, and executes her ideas. She spoke to all the book arts classes and former students. They could not fathom Jen’s lockups and the intricate details. The students enjoyed learning about her process as an artist and her small business. She gave a wonderful lecture and we released our co-published book The Alphabet of Sorts. During her lecture students came to understand that following your dreams and passions is not always easy but at the end of the day you get to do what you love with the ups and downs of operating your own company. 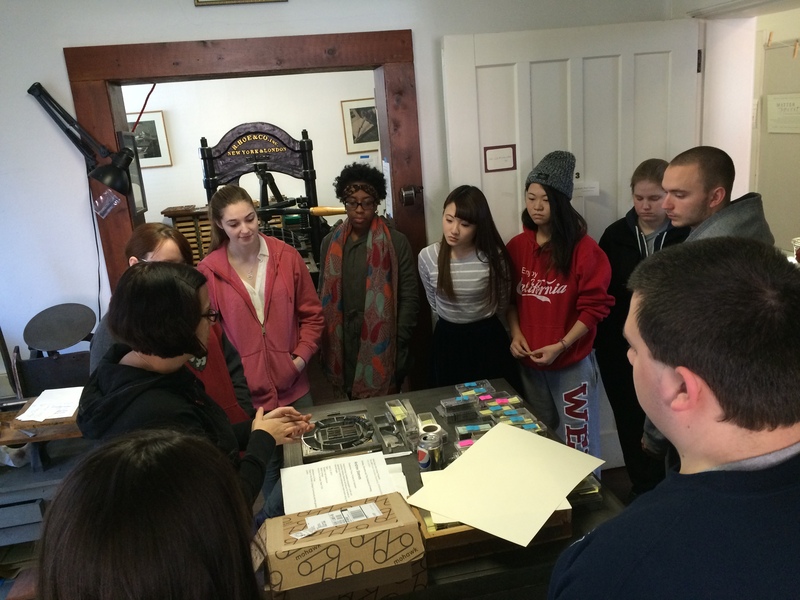 We hosted open studios days where students and community members stopped by and printed with Jen. She completed two posters while she was here. First, The Alphabet Machine which was apropos since we released The Alphabet of Sorts. She also printed the poster for our next Susan Garretson Swartzburg ’60 Book Arts Lecture. She was a busy bee! Also, check out Jennifer’s blog post with her side of the story. If you dig Jennifer’s style and want to work with lots of metal type and ornaments fear not! She is teaching at our Summer Institute in July. You can spend an entire week with her and learn from a master. Click here for more info. This entry was posted in Uncategorized and tagged book arts, bookbinding, jennifer Farwell, letterpress, letterpress printing, Starshaped press, the alphabet of sorts, Wells Book Arts Center, Wells College, wells college press by wellsbookartscenter. Bookmark the permalink.